This blog post reports on work-in-progress within the DfG course! The post is written by one of the two groups dealing with the project brief ‘A Model for Regional Sustainable Circular Food’ from the Finnish Ministry of Agriculture and Forestry and Ministry of Environment with Sitra and Motiva . The group includes Aalto students Andrea Cecilia Cuesta Claros from the MSc program in Creative Sustainability (Real Estate), Helén Marton from the MA program in Creative Sustainability (Design), Anna-Mia Myllykangas from the MA program in International Design Business Management, and Ellinoora Rustholkarhu and Lindsay Simmonds from the MA program in Collaborative and Industrial Design. 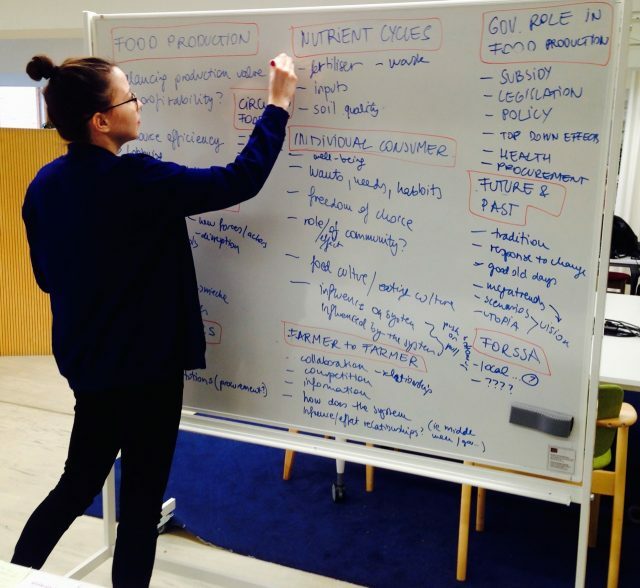 How might we create a regional circular food system in Finland? How can we make profitability and sustainability match in this context? What is circular food anyway, and how could Forssa city embrace it? These are just some of the questions we hope to tackle through our work on A Model for Regional Sustainable Circular Food project brief commissioned by the Finnish Ministry of Agriculture and Forestry (MMM) and the Ministry of Environment’s (YM) with Sitra and Motiva in our 2017 Design for Government (DfG) course. Since the kick-off to DfG on February 21st, it’s been a lively three weeks for the two teams working collaboratively on this brief. Our main task in these early stages is to start discovering the problem space of sustainable food through both reviewing existing research and going out in the field and learning first hand from experts and those with lived experience of the food system. 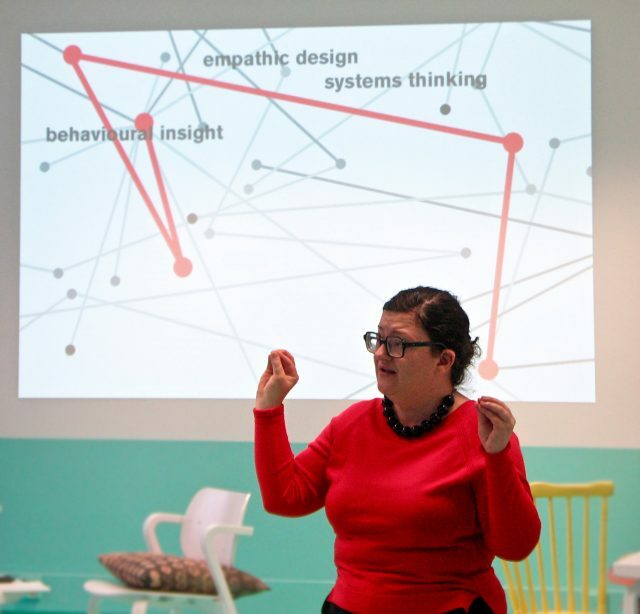 To start things off, last week we hosted a workshop with some of our key stakeholders – namely, Birgitta Vainio-Mattila from MMM and Hanna Mattila from Sitra. As the interviews unfolded, we captured them in a drawn form to document and validate our interpretation on the spot. The first half of the workshop started off on a more traditional note with individual interviews. However, that’s where tradition ended. As we have a few talented visualizers in our super group, we used a “sketchnoting” approach (in addition to textual documentation) to document the interviews. 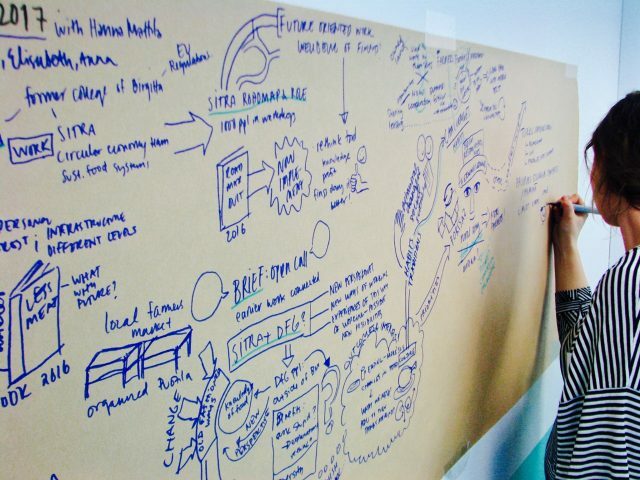 Sketchnoting is a live documentation method performed by a graphic artist that captures conversation and shows processes in sketches and words. 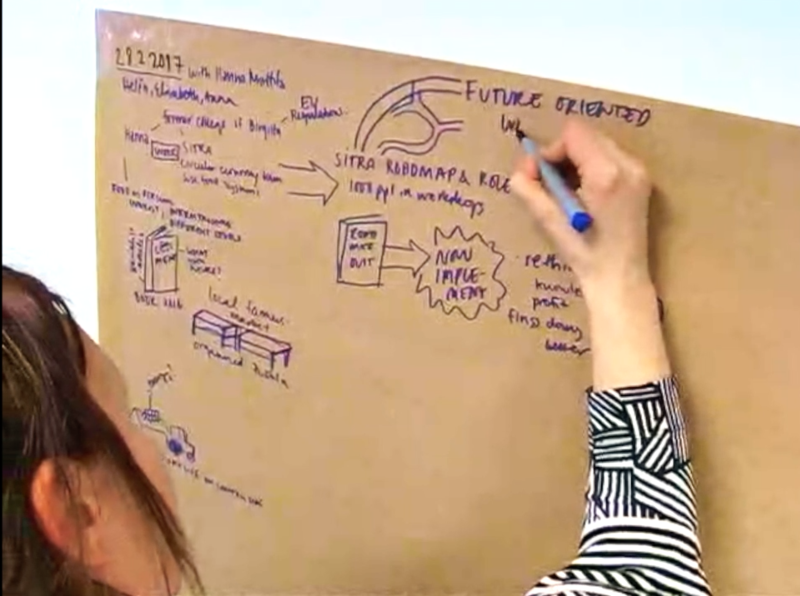 In addition to documenting the ongoing conversation, the sketchnotes acted both as evidence and a tangible format to share and clarify understanding and interpretation between participants on the spot. As a result of the interviews, we began to learn that there are many factors connected to food circularity. For example, one of our interviewees brought up the issue that meat consumption in Finland is at a level that is environmentally unsustainable. As a result, planning a circular food system needs to address both these eating habits and the impacts from meat production. Both interviewees described that they highly anticipate the outcome from the DfG course and encouraged us to use our position as outsiders because we are in a unique position “to ask stupid questions”, which might dig up new ideas beyond the imagination of an inside expert. Participating in design games elicits a playful mindset that encourages dialogue and stimulates creativity. The second half of the workshop was all fun and games! Seriously – using games, design games to be specific, is a fruitful and participatory way to engage stakeholders. 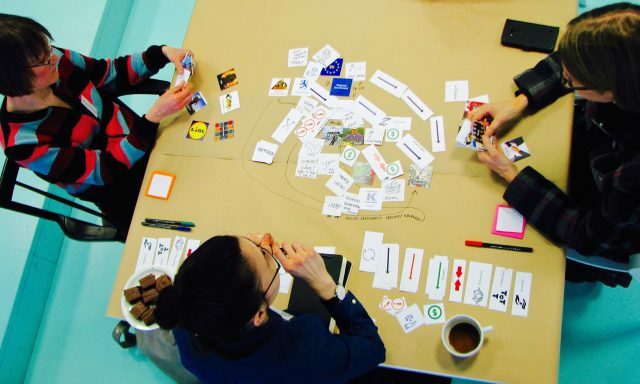 According to design game scholars and practitioners, Tuuli Mattelmäki and Kirsikka Vaajakallio, these games introduce a structure and elicit a playful mindset that can result in a rich output as participants suspend disbelief and immerse themselves in play. We developed a simple stakeholder mapping game that uses cards of different actors in the food systems as prompts. In addition, we provided all kinds of arrows and icons cards to uncover perceived connections between them. We asked the two participants, Birgitta and Hanna, to take turns choosing actors, to place them in relation to others already on the board and to discuss aloud as they do so. Indeed, using a game format uncovered gems of information. For example, we learned that the consumers’ interests are not strongly represented in the Finnish food system and that there is a broken link between nutritional guidelines and actual food production. We also learned that, in this context, “regional” is a relative and not a fixed term, thus, we should consider the larger context surrounding our focus area, Forssa. 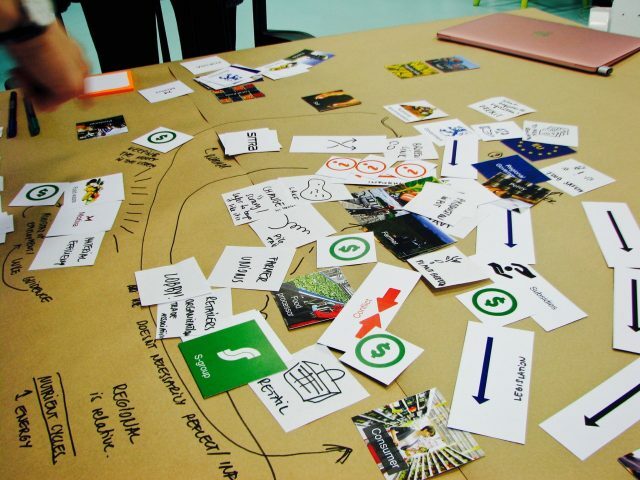 The stakeholder mapping game resulted in rich discussion and a visual interpretation of actors, connections and flows in the Finnish food system. After the first interviews with the stakeholders, it seemed as if the more we found out, the less we knew. Nonetheless, we’re beginning to understand “circularity” as a fractal system that holds various topics under its immense umbrella: bio economy, sharing economy and shared ownership to name just a few. A circular food system should build a food value chain that is equally sustainable and profitable for all stakeholders. Have you considered that waste does not actually exist in nature? Nature reuses each nutrient effectively, the systems we design should strive to do the same. Next, we will begin to form an idea of what a local food system looks like by focussing on Forssa, our primary research area. We will be investigating nutrient cycling, primary production, food manufacturing and eventually the sources of food waste. The regional sustainable food system is complex but not invincible. We surely have to roll up our shirt sleeves and search for the needle in the Forssa haystack. Our teams worked together in synthesizing our findings into concrete themes to tackle throughout our research. The findings from the workshop in addition to numerous discussions and readings around the topic were extremely helpful for drafting our Research Plan. This plan will help us to identify key actors and focus areas, and to direct our attention while we dig into the problem and further develop our understanding. In the following weeks we will travel to Forssa and meet some of the local actors and get a feel for the regional context. We are also hosting a second design game workshop next week with additional stakeholders. The Empathic Design phase of the course, where we deepen our understanding of people through immersive experience, has already begun. We cannot wait to get started!